The first night in Boston. I found a bench seemed good in front of a supermarket. I fell asleep on midnight. Suddenly someone shook my shoulder. I was taken aback by them. Two young guys stood in front of me. It was still late night. I didn't understand what happened. They asked me "Why do you sleep here?" 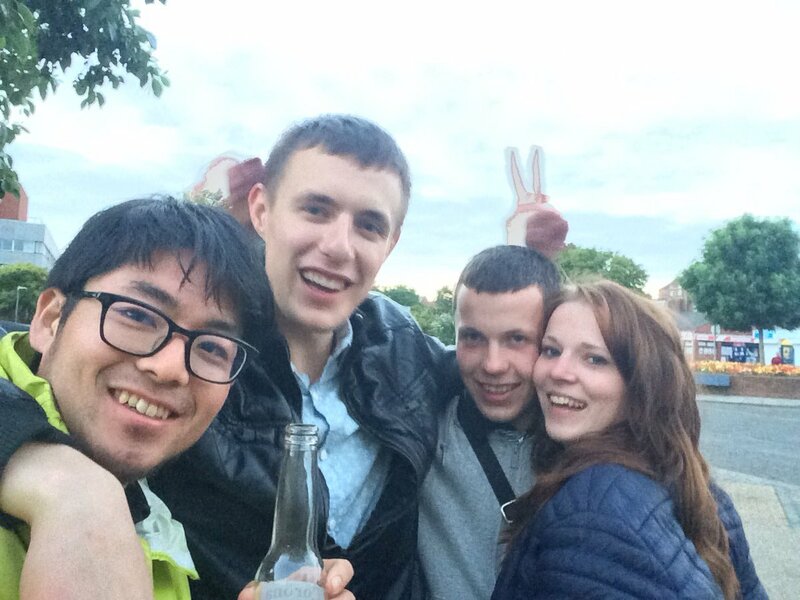 They were looks very drunk and their English was not very good. It was hard to understand easily. I answered " I travel around the UK." Guy "But why do you sleep outside?" "It's not interesting to sleep hotel for me." Guy "???.... Are you homeless?" "Umm. Yeah right, kind of homeless now." Guy "I can find a job and Home for you. You should work." "Thank you but I"m traveling now." Guy "But Why do you sleep here?" They asked me same questions. I politely explained my job, and why I came to Boston. Then they invited me for drinking. I was at a loss what to do but I accepted their invitation. Their name is Lukas and Edgaras who are from Lithuania. 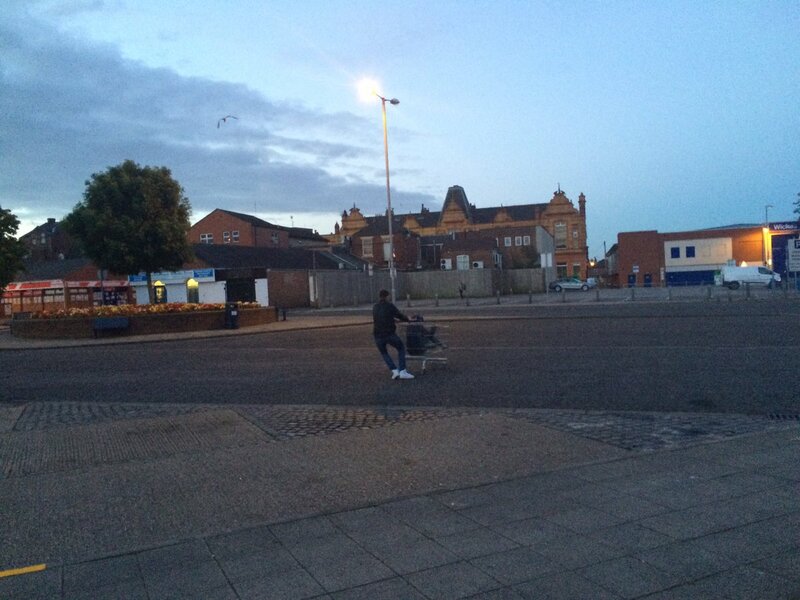 We went to ASDA nearby the city. 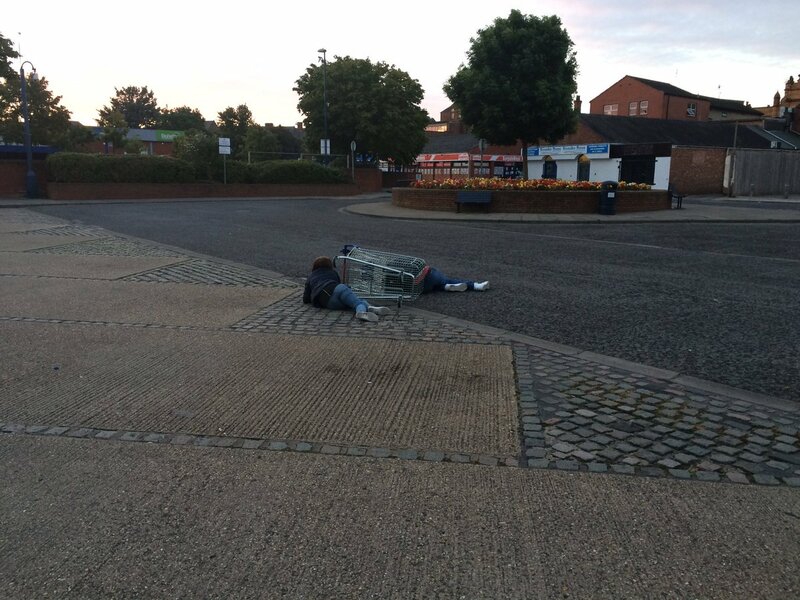 Ed was too drunk, so a security man got him out of the supermarket. Lukas bought beer for us. Their favorite is Corona. They are 19 years old. They came to Boston for work. Lukas's girlfriend came to us then we drunk together and played together! Thank you, Lukas! This was really fun. When we drunk, two policemen came to us. They misunderstood that we were dangerous people. We were crazy at that time, but not dangerous. Policemen asked us to show our ID. 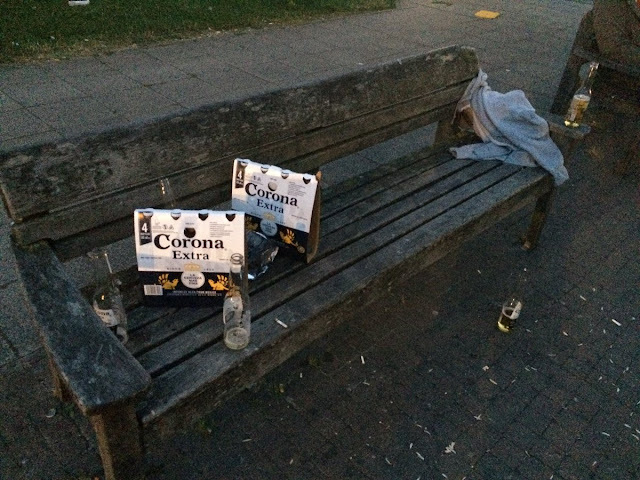 They told us to throw away beer because it's illegal to drink alcohol in public place. The policemen checked our ID and they went back. They saw our broken bin which we had thrown away. They told us to clean up here. I felt jumpy. About 5 AM, Many people got into the buses to work at farm or factory. Lukas and Ed usually go to work like them. Some of the workers work overnight. It became lighter, Lukas, his girlfriend and Ed went back their home. Thank you for taking me for drinking. I enjoyed very much. I cleaned up bins and other trashes around the bench, then I went to back to the city.